Circus meets sculpture in this exciting new show from Ockham’s Razor, winners of the Total Theatre Award for Circus at Edinburgh 2016. The performers, like surfers in a wild sea, ride a giant semi-circular see-saw made of wood and steel which creaks and groans as it transforms from a catapult, a gently rocking cradle, a tunnel, a slide – creating an ever-changing land and soundscape. The concept of the belly of the whale is found in mythology around the world – what happens when we confront our fears and come face to face with the power and momentum of things we seemingly can’t change? 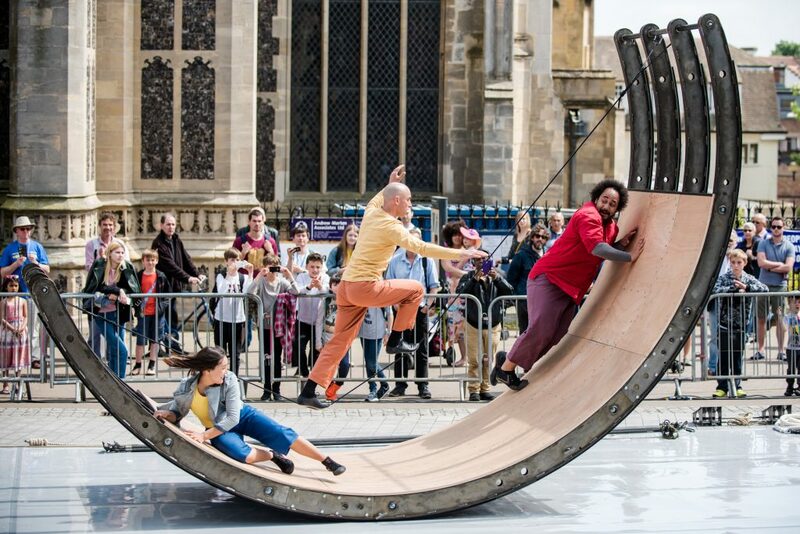 Three performers and a live musician ride a giant semi-circular see-saw made of wood and steel which creaks and groans as it transforms from a catapult, a gently rocking cradle, a tunnel, a slide – creating an ever-changing environment. The concept of the belly of the whale is found in mythology – what happens when we confront our fears and come face to face with the power and momentum of things we seemingly can’t change? Ockham’s Razor is an aerial theatre company that combines circus and visual theatre to make work that is arresting and entertaining. The company specialises in creating physical theatre on original pieces of equipment and create stories from the vulnerability, trust and reliance that exist between people in the air. Commissioned by Without Walls, Stockton International Riverside Festival, Greenwich + Docklands International Festival, Out There International Festival of Circus & Street Arts, Norfolk & Norwich Festival, Salisbury International Arts Festival, Circulate and Stratford Circus Arts Centre.